Russo Lee Gallery is pleased to host an evening of conversation with Samantha Wall, Lisa Jarrett, Melanie Stevens, and Ashley Stull Meyers. All women of color, all transplants to the Portland area, and all actively involved in the northwest visual art scene, the panelists will take us on a wide-ranging discussion of their experiences, struggles, and frustrations in navigating a predominantly white visual art world in Portland and beyond, as well as their hopes and their vision for the role that the visual arts can play in creating a more diverse and inclusive community in which to work and thrive. Originally from Seoul, South Korea, Samantha Wall immigrated to the United States as a child. She received her BFA from The University of South Carolina, Columbia, SC, and her MFA from Pacific Northwest College of Art, Portland, OR. Her work has been featured in both solo and group exhibitions regionally and nationally. 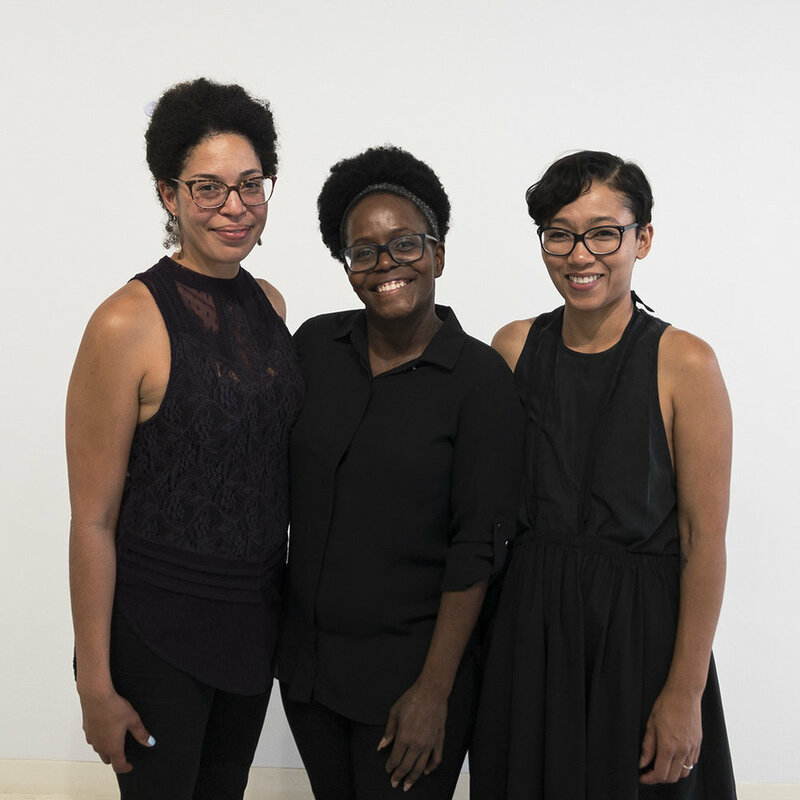 Wall is the recipient of awards and grants from organizations including the Oregon Arts Commission; Portland, Oregon’s Regional Arts & Culture Council; The Ford Family Foundation; and The Joan Mitchell Foundation. She was also a finalist for the Portland Art Museum’s Contemporary Northwest Art Awards 2016 and the winner of the Arlene Schnitzer Prize. Lisa Jarrett is an artist and educator. She is Assistant Professor of Community and Context Arts at Portland State University’s School of Art + Design. She is co-founder and co-director of KSMoCA (King School Museum of Contemporary Art) in NE Portland. Her intersectional practice considers the politics of difference within a variety of settings including: schools, landscapes, fictions, racial imaginaries, studios, communities, museums, galleries, walls, mountains, mirrors, floors, rivers, and lenses. She exists and makes socially engaged work within the African Diaspora. She recently discovered that her primary medium is questions. Melanie Stevens investigates the reinforcement of societal power structures, specifically the narratives centering on people of the African diaspora. Her work juxtaposes a reimagined version while encouraging opportunities for meditation and discourse. She holds a BA from Yale and an MFA from PNCA. Ashley Stull Meyers is a writer, editor, and curator. She has curated exhibitions and public programming for a diverse set of arts institutions along the west coast, including those in San Francisco, CA; Oakland, CA; Seattle, WA; and Portland, OR. She has been in academic residency at the Bemis Center for Contemporary Art (Omaha, NE) and the Banff Centre (Banff, Alberta). She is currently Northwest Editor for Art Practical and has contributed writing to Bomb Magazine, Rhizome, Arts.Black, and SFAQ/NYAQ. In 2017 Stull Meyers was named Director and Curator of the Art Gym and Belluschi Pavilion at Marylhurst University. She is based in Portland, Oregon. This is the seventh installment of PADA's Art Conversations 2018, a monthly series of gallery talks focused on art collecting and the arts ecology of our city, which will continue through December 2018. Click HERE for a schedule of talks.